Wisdom of Assi; His Death. A prænomen of several amoraim, which, with its variants, is a modification or diminutive of "Joseph" (compare Bacher, "Ag. Tan." ii. 371; "Ag.Pal. Amor." ii. 151, 8). "Assi" is of Babylonian origin, while other forms are Palestinian. Hence in the Babylonian Talmud, except in cases of clerical error, "Assi" is the only form used; whereas in the Palestinian Talmud and Midrashim all forms are used indifferently, two or even more appearing in a single passage (for instance, Yer. Kil. ix. 32b) or in parallel passages (compare Yer. 'Er. vi. 23d; Yer. Sheḳ. ii. 46d, vii. 50c; Yer. Naz. iv. 53b). As to the bearers of the name, most of those having additional patronymics or cognomens are better known by the appellation of "Jose." The two that are best known by their simple prænomen, without further designation, are considered here. Great care is requisite in determining the authorship of doctrines and sayings bearing the above name. Both the Assis are halakic authorities, are native Babylonians, and are cited in both Talmudim, and they flourished within about half a century of each other. They can therefore be distinguished only by observing the persons with whom they are associated or who transmit their opinions. Thus, where Assi appears in company with Rab, with Samuel, or with their contemporaries, Assi I. is meant; but where the associates are members of a later generation, it is Assi II. Again, where Huna I., Judah b. Ezekiel, or their contemporaries or predecessors cite the name, it is Assi I.; but where their disciples, or their younger contemporaries or successors (particularly in the Palestinian Talmud and Midrashim) report, it is most frequently Assi II. Where, finally, none of these landmarks is present, a positive determination is well-nigh impossible, nor can the presence or absence of the titles Rab and Rabbi, on which (according to Tos. Ḥul. 19a, s.v. Amar) many rely, be accepted as a clue. Assi (Assa, Issi) I., Rab: Status. A Babylonian amora of the first generation, third century; contemporary of Rab (Abba Arika) and his equal in dialectics, though inferior to him in general knowledge of the Halakah (Sanh. 36b). But even in the latter branch Rab manifested great deference for Assi's opinions, often adopting these in preference to his own (Meg. 5a; Ḳid. 45b; Sanh. 29b; B. B. 62a). Socially, also, Rab treated Assi as an equal (Shab. 146b). Mar Samuel, also, treated Assi with great respect (B. Ḳ. 80a et seq.). 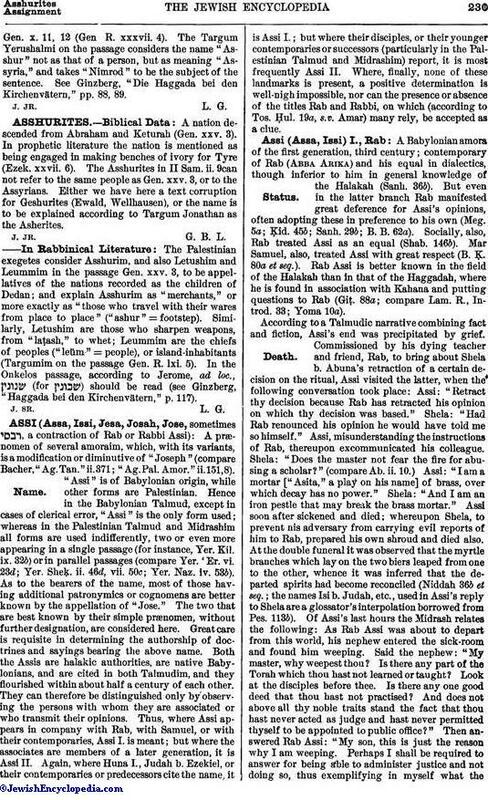 Rab Assi is better known in the field of the Halakah than in that of the Haggadah, where he is found in association with Kahana and putting questions to Rab (Giṭ. 88a; compare Lam. R., Introd. 33; Yoma 10a). According to a Talmudic narrative combining fact and fiction, Assi's end was precipitated by grief. Commissioned by his dying teacher and friend, Rab, to bring about Shela b. Abuna's retraction of a certain decision on the ritual, Assi visited the latter, when the following conversation took place: Assi: "Retract thy decision because Rab has retracted his opinion on which thy decision was based." Shela: "Had Rab renounced his opinion he would have told me so himself." Assi, misunderstanding the instructions of Rab, thereupon excommunicated his colleague. Shela: "Does the master not fear the fire for abusing a scholar?" (compare Ab. ii. 10.) Assi: "I am a mortar ["Asita," a play on his name] of brass, over which decay has no power." Shela: "And I am an iron pestle that may break the brass mortar." Assi soon after sickened and died; whereupon Shela, to prevent his adversary from carrying evil reports of him to Rab, prepared his own shroud and died also. At the double funeral it was observed that the myrtle branches which lay on the two biers leaped from one to the other, whence it was inferred that the departed spirits had become reconciled (Niddah 36b et seq. ; the names Isi b. Judah, etc., used in Assi's reply to Shela are a glossator's interpolation borrowed from Pes. 113b). Of Assi's last hours the Midrash relates the following: As Rab Assi was about to depart from this world, his nephew entered the sick-room and found him weeping. Said the nephew: "My master, why weepest thou? Is there any part of the Torah which thou hast not learned or taught? Look at the disciples before thee. Is there any one good deed that thou hast not practised? And does not above all thy noble traits stand the fact that thou hast never acted as judge and hast never permitted thyself to be appointed to public office?" Then answered Rab Assi: "My son, this is just the reason why I am weeping. Perhaps I shall be required to answer for being able to administer justice and not doing so, thus exemplifying in myself what theScripture means by saying (Prov. xxix. 4), 'The king by judgment establisheth the earth; but the man that holdeth himself aloof ["terumah" = separation] overthroweth it'" (Tan., Mishpaṭim, 2). Some writers regard this scene as occurring at the death of Assi II. ; but the concluding words of the visitor's address, as well as the dying teacher's reason for his anxiety, are entirely inconsistent with the career of Assi II., whose activity as judge is a prominent feature of his life. (Yer. Shab. i. 3a; Yer. Sheḳ. vi. 50b; Yer. Suk. i. 52a; Yeb. 16b; Ned. 21b; Yer. Ned. iii. 37d; Yer. Giṭ. ix. 50d; B. B. 126a; Shebu. 26a, 41a; Ḥul. 19a, 20a). Halevy, Dorot ha-Rishonim, ii. 228. A Palestinian amora of the third generation, third and fourth centuries; one of the two Palestinian scholars known among their Babylonian contemporaries as "the Palestinian judges" and as "the distinguished priests of Palestine," his companion being R. Ammi (Giṭ. 59b; Sanh. 17b). Assi was born in Babylonia, where he attended the college of Mar Samuel (Yer. Ter. i. 40a; Yer. 'Er. vi. 23d), but later emigrated in consequence of domestic trouble. On his arrival in Tiberias, Assi had an adventure with a ruffian, which ended disastrously for the latter. Assi was making his way toward the baths, when he was assaulted by a "scorner." He did not resent the assault, except by remarking, "That man's neck-band is too loose," and continued on his way. It so happened that an archon was at that very hour trying a thief, and the scoffer, still laughing at the adventure with Assi, came to witness the trial just when the judge interrogated the culprit as to accomplices. The culprit, seeing the man laughing, thought that it was at his discomfiture, and to avenge himself pointed to the ruffian as his accomplice. The man was apprehended and examined. He confessed to a murder he had committed, and was sentenced to be hanged with the convicted thief. Assi, on returning from the baths, encountered the procession on its way to the execution. His assailant on seeing him exclaimed, "The neck-band which was loose will soon be tightened"; to which Assi replied, "Thy fate has long since been foretold, for the Bible says (Isa. xxviii. 22), 'Be ye not scorners lest your bands be made strong '" (Yer. Ber. ii. 5c). Assi became a disciple of R. Johanan, and so distinguished himself that R. Eleazar called him "the prodigy of the age" ("mofet ha-dot"; Hul. 103b), and as such legend pictures him. Concerning the futile longings of many to communicate with the departed spirit of R. Hiya the Great, legend relates that R. Jose fasted eighty days in order that a glimpse of R. Hiya might be granted him. Finally the spirit of the departed appeared; but the sight so affected R. Jose that his hands became palsied and his eyes dim. "Nor must you infer from this," the narrator continues, "that R. Josah was an unimportant individual. Once a weaver came to R. Johanan and said, 'In a dream I have seen the skies fall, but one of thy disciples held them up.' When asked whether he knew that disciple, the weaver replied that he would be able to recognize him. R. Johanan thereupon had all his disciples pass before the weaver, who pointed to R. Josah as the miraculous agent" (Yer. Kil. ix. 32b; Eccl. R. ix. 10). Another adventure, which, however, bears the impress of fact, is related of him, wherein he was once abducted in a riot and given up as lost, but R. Simon ben Lakish, the former gladiator, rescued him at the risk of his own life (Yer. Ter. viii. 46b). Assi's professional career in Palestine is so closely intertwined with that of R. Ammi that the reader may be referred to the sketch of the latter for information on that subject. R. Assi was very methodical in his lectures, making no digressions to answer questions not germane to the subject under discussion; and whenever such were propounded to him, he put off reply until he reached the subject to which they related (Yer. Shab. xix. 16d; Yer. 'Er. vi. 24a). R. Assi is frequently quoted in both Talmudim and in the Midrashim. Profound is his observation: "At first the evil inclination is like a shuttle-thread (or spider-web), but eventually it grows to be like a cart rope, as is said in the Scriptures (Isa. v. 18), 'Wo unto them that draw iniquity with cords of vanity, and sin as if it were with a cart rope'" (Suk. 52a). An anecdote characteristic of rabbinical sympathy for inferiors and domestics is thus related: The wife of R. Jose had a quarrel with her maid, and her husband declared her in the wrong; whereupon she said to him, "Wherefore didst thou declare me wrong in the presence of my maid?" To which the rabbi replied, "Did not Job (xxxi. 13) say, 'If I did despise the cause of my manservant or of my maidservant, when they contended with me, what then shall I do when God riseth up? And when He visiteth, what shall I answer Him?'" (Gen. R. xlviii. 3). When Assi died, R. Hiya b. Abba, who had been his associate as judge and as teacher, went into mourning as for a relative (Yer. Ber. iii. 6a). The day of his death is recorded as coincident with a destructive hurricane (M. Ḳ. 26b). 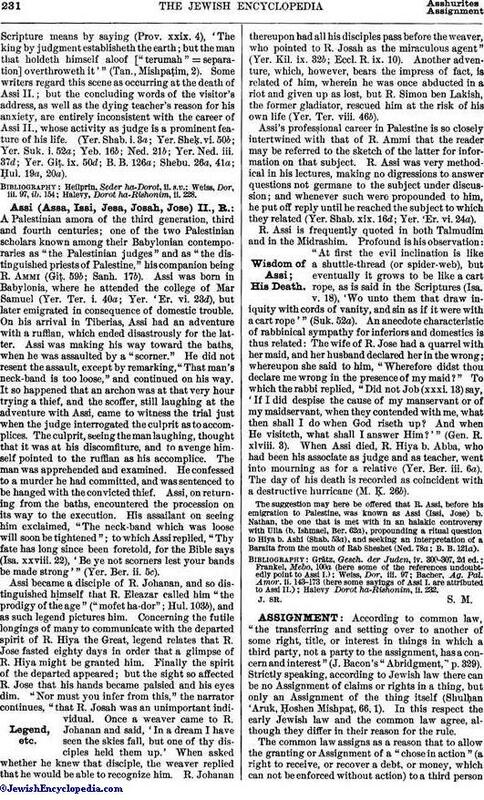 The suggestion may here be offered that R. Assi, before his emigration to Palestine, was known as Assi (Issi, Jose) b. Nathan, the one that is met with in an halakic controversy with Ulla (b. Ishmael, Ber. 62a), propounding a ritual question to Hiya b. Ashi (Shab. 53a), and seeking an interpretation of a Baraita from the mouth of Rab Sheshet (Ned. 78a; B. B. 121a). Halevy Dorot ha-Rishonim, ii. 232.